This page is a comprehensive layout of the best propane smokers on the market today. Before we dive into the nitty gritty, we have compiled a table of our Top 10 picks for 2019. Ready? Let's go! Is a Propane smoker good? 4 Is a Propane smoker good? The Lion Premium Grills 90814 is a rugged smoker that’s made for the smoking hobbyist who wants to make sure that every single time he uses it to cook either for family or friends, the results are going to be mouthwatering. In this regard, the Lion Premium 90814 delivers in more ways than one. First of all, this is a forty inch smoker that features five high quality stainless steel burners for a total of ninety thousand BTUs. Its cooking surface is simply massive and at 1030 sq. inches, you can easily cook multiple meals on it at the same time. Build quality is excellent and the smoker is made of 304-sixteen gauge commercial grade stainless steel, meaning that no matter how often you’re going to use it, it’s going to last you for many years to come. 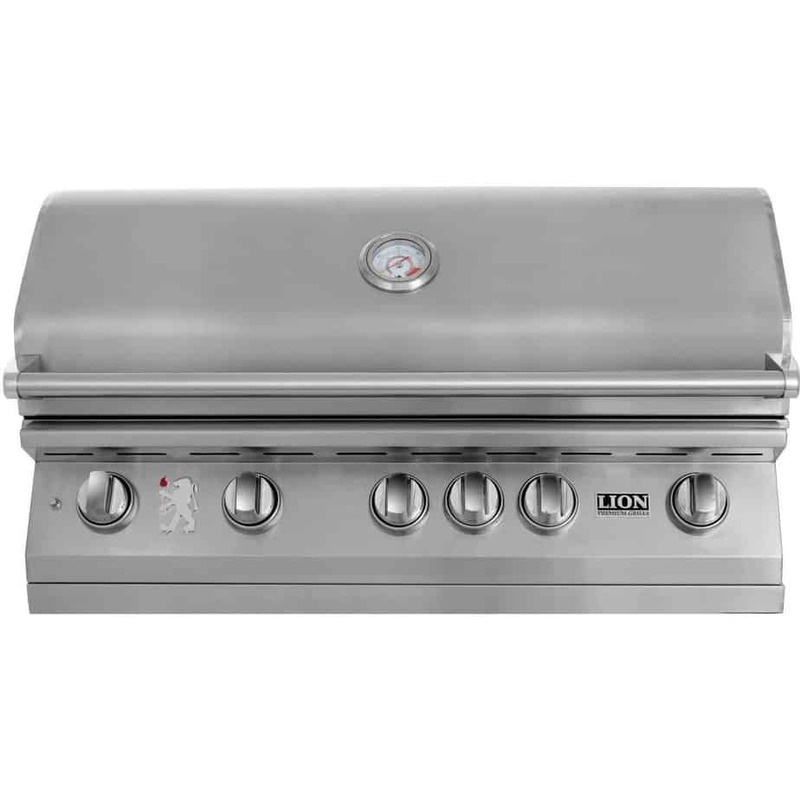 Other than that, the Lion Premium 90814 also features rugged stainless steel cooking grates, two interior lights, a stainless steel light switch, but also an infrared rotisserie backburner, a warming rack that can be easily adjusted and six commercial size knobs (push to turn). As you can see, these features are top notch and should be enough for both novice and experienced smokers to cook a wide range of tasty meals. With a total cooking surface of 1476 square inches, the 3895GWLA from Landmann USA is one of the largest smokers you can currently get. Besides its spacious design, it also incorporates very useful features such as easy access drawers with handles that allow you to easily gain access to the water pan and the wood chip box without having to worry about opening the main chamber door. The 3895GWLA also features a magnetic door closing system that effectively latches the door. There are of course, many other features you’re going to love about this incredible smoker, including a heavy duty steel wood chip box (with lid), a steel water pan (coated in porcelain), large nylon plastic door handle, adjustable side damper vents that feature tab guards made of plastic to effectively control temperature, and an adjustable top chimney. Lastly, you also get a high quality burner made of cast brass that won’t rust and a massive 10-year warranty. The Bull 69008 LP smoker is probably one of the Best Propane Smokers out there if you’re looking for a great combination of affordability and great features. First of all, the steer on-cart grill of this bad boy features three burner technology which means that heat is distributed evenly across the surface of five hundred and sixty four square inches. The smoker’s stainless steel construction with three welded bar burners (stainless steel) and stainless steel grates give you the peace of mind that you’re getting your hands on a very rugged smoker. Taking a closer look at the knobs, you’ll notice right away that they’re made of high quality zinc and can be used to adjust the flames to push out a massive fifteen thousand BTUs per burner. There’s also a warming rack included with the burner which makes it easy to keep your meals warm and ready for when the guests arrive. If by any chance you’d like to move the smoker around, then you don’t have to worry about calling a friend to help you with it. That’s because the Bull 69008 LP features four heavy duty casters that makes moving it a breeze. Lastly, cleaning the smoker takes just a few minutes thanks to the grease tray underneath it. The L75625 from Lion Premium is a solidly built smoker that’s easy to use, is decently priced and come with a lifetime warranty which most people are definitely going to love. Therefore, if you’re looking for a smoker that’s affordably priced, but also one that has a large cooking surface, then you should give the L75625 a serious consideration. Its massive cooking surface of 830 sq. in is enough for most users and it’s also large enough if you plan to cook for more than ten people. The grills from Lion are built to last and this model makes no exception by incorporating 304 stainless steel with a double lined hood that’s made of high quality stainless steel. The L75625 also features caster burners that do indeed radiate heat quite well, but also last a bit longer than those found in other burners. If you want to upgrade it, then Lion makes it easy to do that by offering you the option to replace the standard steel flame tamers with a rod flame taming system (ceramic). With this new upgrade, you’ll be able lot cover more grilling area and have the heat evenly distributed across the grilling surface. To top things off, you get a lifetime warranty which is the icing on the cake for an already amazing smoker. No matter where you plan on traveling, the Solaire portable grill will help you enjoy flavorful and succulent food. Each smoker made by Solair features an infrared burner underneath it which produces a lot of heat that’s vital for locking in the juices of your meats that are responsible for that delicious BBQ taste we all love. The build quality of the Solaire smoker is excellent, with the company opting for commercial quality stainless steel with a honeycomb infrared burner (ceramic) sitting beneath one hundred and fifty five sq. inches of grilling area. The smoker also comes with lights that can be activated with the push of a button and are very useful when cooking in low-light conditions. Taking a closer look at the firebox, you’ll realize that the manufacturer didn’t use mechanical fasteners and decided to completely weld it. While it’s true that a little bit of assembly is required for this model (the regulator and handles), besides that there’s nothing more to worry about putting together. Given the fact that it can produce 14000 BTUs per hour, but also comes with V-shape stainless steel grilling grids and is built like a tank, you’ll be able to enjoy using the Solaire Portable Grill for many years to come. Featuring infrared rear burners and bottom, the Napoleon BILEX605RBIPSS is one that you’re certainly going to love using for cooking a wide range of delicious meals for family, friends and also the parties you may throw at your place. The first thing you’re going to notice about it is that it has a large capacity of 850 square inches, which makes it possible to smoke multiple meats on it in a single session. 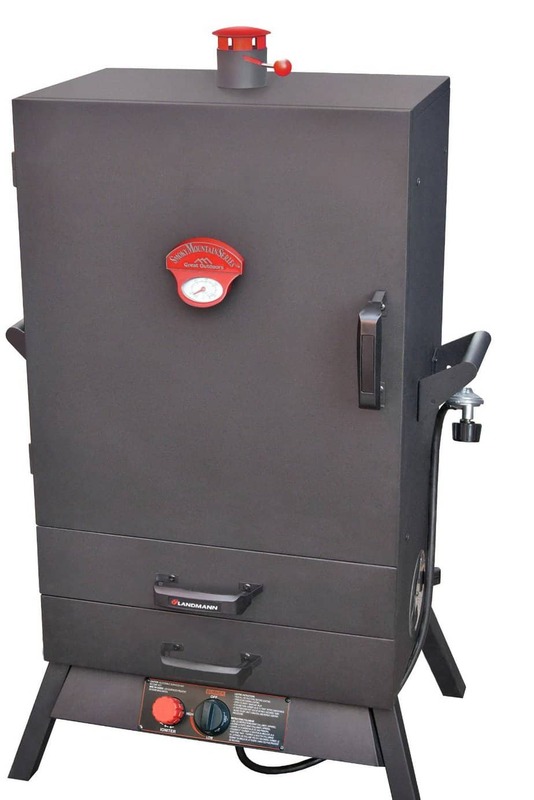 Build quality is always important when buying a smoker and in this regard, the Napoleon BILEX605RBIPSS is built from stainless steel and has a very solid and rugged feel to it. However, you’ll notice that unlike other propane smokers out there, it does come with a set of very interesting features, including the Accu Probe temperature gauge, the Jetfire Ignition system and the Life ease space saving roll top lid. The commercial grade burners are also made from very solid, heavy-gauge stainless steel and are definitely going to last you for many years to come. In order to control flare-ups and vaporize drippings, Napoleon decided to incorporate stainless steel sear plates which do their job pretty well. Given the fact that the Napoleon BILEX605RBIPSS is very compact and light, you can easily transport it wherever you want with minimum effort. The Spirit E210 is the new version of the 2013 model and as you can probably tell from the way it looks and its features, it has been fully reimagined. The control panel was moved to the front, while two tables (made of stainless steel) can be easily folded down in order to allow for easy storage and maneuverability. This is in fact a very big advantage for grillers with small balconies, decks or patios. And while it’s true that the smoker has a small form factor, it’s big enough to cook a twenty lbs turkey or roast vegetables or meats at the same time. The cast iron cooking grates in the Spirit E210 are enameled in porcelain which means that compared to regular grates, they have superior heat retention and can also be cleaned up a lot easier. In time, you also don’t have to worry about the enamel rusting, peeling or fading, which is a big plus. Lighting up the 2 burners is as simple as pushing a button and given the fact that the Spirit E210 is also fitted with a fuel gauge, you can always tell how much fuel you have left in it. Keep in mind that the Spirit E210 doesn’t include a tank with the grill and it won’t come assembled as well. Since it’s capable of outputting 26500 BTUs per hour through its 2 burners and thanks to the fact that it has a decent 360 sq. inch of cooking surface, you can rest assured that the Spirit E210 is going to help you cook some of the most delicious meats you’ve ever had. If you’re after that truly distinct flavor that you can only get from a smoker, then there’s no other smoker out there that will satisfy your needs in terms of features, price and build quality than the Dyna Glo DGY784BDP. Thanks to its cast iron burner capable of outputting 15000 BTUs, this model allows you to enjoy smoked meals all year round. The double door design is truly special and it’s meant to reduce the changes in temperatures when you access the food or when you want to add wood chips or water. Build quality is simply excellent and the DGY784BDP is made of heavy duty steel and features a powder coat, high temperature finish that guarantees a long life, while the condensation and grease management system greatly reduces the time you need to spend cleaning it. In total, you get a 784 sq. inches of cooking space which means that you can cook chicken, ribs and steaks in a single session, therefore saving you precious time. Lastly, you’ll be very happy to know that the DGY784BDP is also CSA certified and also comes with a one year warranty. However, given its solid stainless steel construction, you won’t need to use the warranty anytime soon. The Smoke Hollow 44241G2 smoker is undoubtedly the only smoker the company produces that’s larger than any other models in their lineup. It features a forty four inch double door cabinet that makes it easy for you to feed the wood pans and the water without being forced to access the top door, therefore releasing smoke and heat. This way, not only will you be able to control internal moisture, but also internal heat which directly impacts the time it takes to smoke your meals and how delicious they’re going to taste. Other features you’ll love about the 44241G2 include the dual gas control system which increases the temperature range (low to high), the 2 stainless steel inline burners which can be controlled separately and have a total output of 10000 BTUs and the welded and 1 rib rack, 2 jerky trays and 3 standard cooking grates. Since you can easily assemble it in just ten minutes, you can start smoking your favorite meats in no time and finally get to taste the amazing smoked culinary works of art that everybody seems to associate with the Hamilton Beach Gas Grill. If you’ve had a smoker before, then you probably know that assembling it takes a few hours, but that’s not the case when you get a Hamilton. Now leaving assembly aside, the Hamilton grill does come with a set of very impressive features, with the most noteworthy one being its five burners that are able to output 61000 BTUs. The burners sit on a large cooking area coated in porcelain that measures 641 square inches and is enough to cook lots of meals for either you and a couple of friends and even a group of people. If you take a quick look at the side, you’ll also notice that this model comes with a convenient side burner that’s used for boiling, sauteing and also heating. Speaking of which, you can always tell the temperature inside the smoker thanks to the oversized temperature gauge it’s fitted with. At the end of the day, no matter if you’re just a novice smoker or have been doing it for many years, the Hamilton Beach Gas Grill will certainly not disappoint you. Whether is build quality that primes when looking for a smoker or maybe certain various without which you wouldn’t be able to cook those delicious meals you’re probably known for, the Lion Premium Grills 90814 won’t hold you back in any way. In fact, this is a solidly built smoker that comes with a host of features which is going to make you change your opinion about smoking meats. It’s not only its 1030 sq. in cooking surface that helps get its point across as being one of the best smokers out there, but it’s also made of 304-sixteen gauge commercial grade stainless steel, meaning that no matter how often you’re going to use it, it’s going to last you for a very long time. Because of these amazing features and more, the Lion Premium Grills 90814 is by far the best propane smoker money can buy! When it comes to build quality, features and especially price, there’s no other smoker out there that’s going to even come close to what the Dyna-Glo DGY784BDP can offer you. With a cast iron burner capable of outputting 15000 BTUs, but also incorporating a double door design, you can already get an idea of well this model has been thought out. You also get 784 sq. inches of cooking space which means that you can cook chicken, ribs and steaks in a single session, therefore saving a lot of time that you can then spend with your guests by enjoying the delicious meals you’ve just prepared. Given the fact that the DGY784BDP is also CSA certified and is very easy to clean, it ranks as one of the best value oriented smokers you can find on the market today. Highly recommended! people, you need to get a reliable propane smoker that’s perfectly cut out for the job. The truth is that if you’re not a pitmaster though, then chances are that you may not know what features to look for in a smoker. And while you may have heard about a few of them that you definitely need to consider, there’s a good chance that you still don’t have a complete picture of what to bear in mind when looking for a smoker. The good news though is that in the paragraphs below we’ve covered everything you should consider when buying your first propane smoker, so that your first ever meal cooked with it is going to taste simply amazing. One of the first things you’ll need to keep in mind when selecting a smoker is the effective cooking surface you’re going to get. However, you do need to think about the number of people you plan on cooking for before deciding on how large or small the cooking surface should be. Speaking of which, if you want, you can also use racks to the interior surface in order to augment the cooking surface based on your needs. For many first time buyers, size is very important when deciding on a smoker. For instance, if you’re the type who travels often and you’d like to also take your smoker with you on a trip from time to time, then you need to think about getting one that’s easily transportable. Some desirable attributes in your smoker in this case would be collapsible spacing and detachable legs. Did you know that there are actually smokers out there that have capabilities which extend beyond their initial use (i.e. smoking meats)? For instance, you could get a grillsmoker combination unit that uses open flame smoking sections and cooking surfaces in a single, unified design. This specific solution won’t only make it easier to smoke meats, but also cook a wide range of other delicious meals. You need to see whether the smoker you plan on getting can be easily cleaned and maintained by reading some of our Reviews online. For instance, those that come with a detachable ash pan and are designed so that they can be cleaned with little effort are the ones you should be on the lookout for. A few preventative measures and basic precautions are going to go a long way when it comes to avoiding irreparable damage. Eventually, you will need to replace one or more parts of your smoker, since accidents, regardless of how careful you are when using your smoker, are prone to happen. Because of that, prior to getting a smoker, you should also research and see how easy it is to find and buy parts for it. At this point we can safely say that you have a better idea of what to consider when it comes to buying the right smoker for your needs. To make it even easier for you, we’ve also reviewed the top 10 Best Propane Smokers on the market today which we think are going to make it easy for you to find one that fully meets your needs.